THE BATTERY CONSERVANCY PROJECT - When construction crews, green parks and gardens meet, nature often loses. 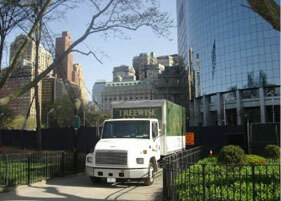 Treewise at the Battery Conservency. Downtown Manhattan has suffered over the past number of years. At Battery Park, the abuse of payloaders, bulldozers, and other massive equipment, had damaged and compacted much of the soil. Years of neglect only made matters worse. The parks, gardens and greens needed acute care. The foundation of Treewise’s work begins with the soil’s health and the specimen’s vitality. 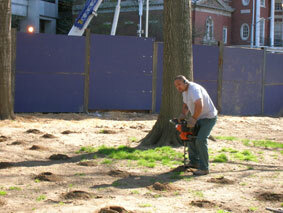 Our crew began their restoration project of 12 severely distressed trees– 5 oak and 7 plane trees– on April 19, 2006. Drilling deep into the concrete-like soil, set in motion the unleashing of new life.